Started the stroker crank reassembly process. Waiting on a new rod to arrive. When rechecking clearances, a 76.2mm stroker is certainly possible and will be in the next engine for sure. 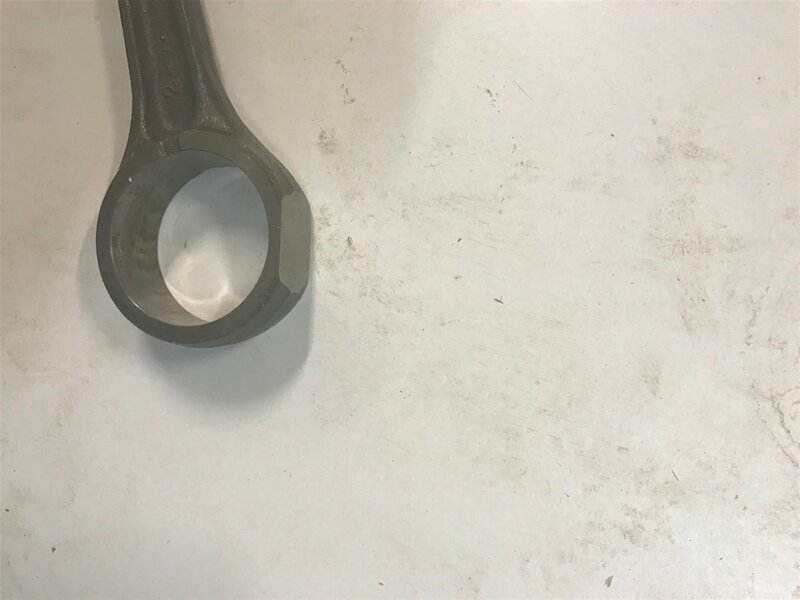 By using a step pin, is is possible to lighten the crankshaft as much as a stock crank without requiring a rebalance after doing so. Would you mind showing a photo of how the big end of the rod is modified for 3rd gear main shaft clearance with that stroke. Im pretty sure that many others may be interested in knowing about that aspect of what it takes to install a Stroker in a 230f? I clearanced an old rod to check things out and I will post an image tomorrow. How do you get the rod onto the stepped pin? That is very observant Baja! I just received this offset Pin from Greenhuman and it came with a split 2 piece bearing to allow the rod to be installed over the step. I can take a pic of the bearing later, but I don't have the rod yet. The crank pin where it goes in crank half is smaller,then big end of rod. So thats how I think rod passes to off set. Correct me if Im wrong? That would make for a nice video magic trick. That would work for a 5spd 150f but not a 230f six speed... needs some additional whittling to get it done. In fact the OEM center case gasket wont clear the big end of the rod on a 230f at 6mm. And you say 8mm stroke will work on a 230f? Won't work? Already is and spinning freely with the stock 6 speed with plenty of clearance. Going to a smaller pin, bearing and rod when you don't need to is a waste of time and reliability. I wish some of you blokes would have a little faith. In fact a 76mm stroker is next with the 6 speed. Don't be so defensive Mr. Human. We ALL know that you have every necessary skill to make it work, obvoulsly! Chill. I enjoy learning from you and appreciate your sharing with everyone. Ok. I am having trouble getting what you mean. This is a 6 speed crf230 engine with the 8mm stroker and this basic engine is imported from the U.S so should be no different from the ones in your garage. And don't be so formal. You can call me Green. Do you mean +4mm overall stroke increase (2mm pin) or +8mm (4mm pin)? I was hoping to find a reasonable price to. "And I want it for cheap too"
I didn't say I wanted it cheep just reasonable I'll pay for horsepower . And I do realize what crafty work goes into this type of special craftsmanship. Thanks though for setting me straight.